Noah Baumbach started off with Kicking and Screaming (1995), a film, which chronicled his generation of well-off and educated twentysomethings. With Frances Ha (2013) he’s come full circle, dramatizing a new twentysomething generation in a funny and often poignant way that feels personal. It is a film anchored by a winning performance from his leading lady, Greta Gerwig. Frances (Gerwig) and Sophie (Sumner) are best friends that live together in Brooklyn, New York. They’re in their twenties with their whole lives ahead of them. They enjoy each other’s company as evident from the opening montage of the two women hanging out, doing laundry and generally goofing around. They are so close that their respective boyfriends don’t seem to last. Frances and Sophie dream big and half-jokingly plan to take over the world. It’s the kind of lofty goal that one makes at that age before the responsibility of a spouse and kids brings such dreams crashing back to reality. Everything seems to be going swimmingly until Sophie drops a bombshell on Frances: she is moving out and in with a friend in Tribeca. Coincidentally, Frances just broke up with her boyfriend because he wanted her to move in with him! Unable to afford the rent, Frances moves in with Lev (Driver) and Benji, two friends of Sophie, which sets up a kind of Jules and Jim (1962) for the new millennium vibe. Co-written with his leading lady, Frances Ha is Baumbach’s cinematic love letter to Greta Gerwig. She’s an interesting actress to watch and the camera clearly loves her. With this film, she and Baumbach have created a fascinating, layered character trying to figure out what she wants to do with her life. Frances is faced with the possibility that she might not be able to make a living as a professional dancer. It is this prospect of an uncertain future that freaks her out and Gerwig does a nice job of conveying how Frances’ dilemma affects her. Much has been made of the French New Wave vibe to Frances Ha. Not only does Baumbach adopt the black and white look of those films, but there is a loose, almost improvisational quality that emphasizes character and behavior over story. This is typified in a wonderful sequence that sees Frances running enthusiastically through the streets to “Modern Love” by David Bowie. In some respects, Baumbach has created the Manhattan (1979) for the same generation that catapulted Lena Dunham to fame. 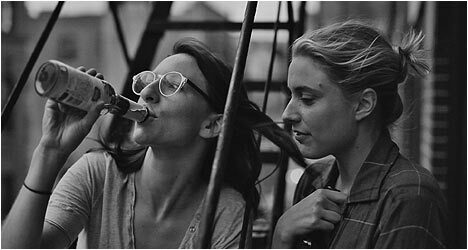 Not only is Frances Ha an entertaining look at a young woman’s life, but it also takes a rare look at a friendship between two women that isn’t explored enough on film and television. The Blu-Ray edition of Frances Ha features a virtually flawless transfer with excellent contrast and detail that really makes the black and white cinematography that much richer and atmospheric. There is a conversation between filmmakers Peter Bogdanovich and Noah Baumbach with the latter talking about the origins of Frances Ha and its cinematic influences. He talks about collaborating with Gerwig and how they wrote the screenplay. He also talks about the decision to shoot digitally and in black and white. Also included is a conversation between actresses Sarah Polley and Greta Gerwig. The talk about the latter’s performance in the film and she explains some of the choices she made in creating the character. While the previous extra focused on direction, this one is about acting with two talented thespians engaged in an engrossing conversation. “Interpreting Reality” features Baumbach, director of photography Sam Levy and Pascal Dangin, who did the color mastering, discussing the look of Frances Ha. They shot the film digitally and in color, and then transferred it into black and white. There’s footage of test shots as they tried out cameras and various lens. This is a fascinating discussion of the exciting and new world of digital filmmaking. Finally, there is a trailer.